The Royals first-game, the Royals first win. It was Opening Day 1969 and major league baseball was back after the only year (1968) in which Kansas City had had no professional baseball dating back to 1884. And the Royals got Kansas City back into the swing of things in style with an extra innings win against the eventual American League Western Division Champion Minnesota Twins. The game marked manny firsts for the Royals – led by Lou Piniella who was the Royals first hitter; got the Royals first hit; and scored the Royals first run. 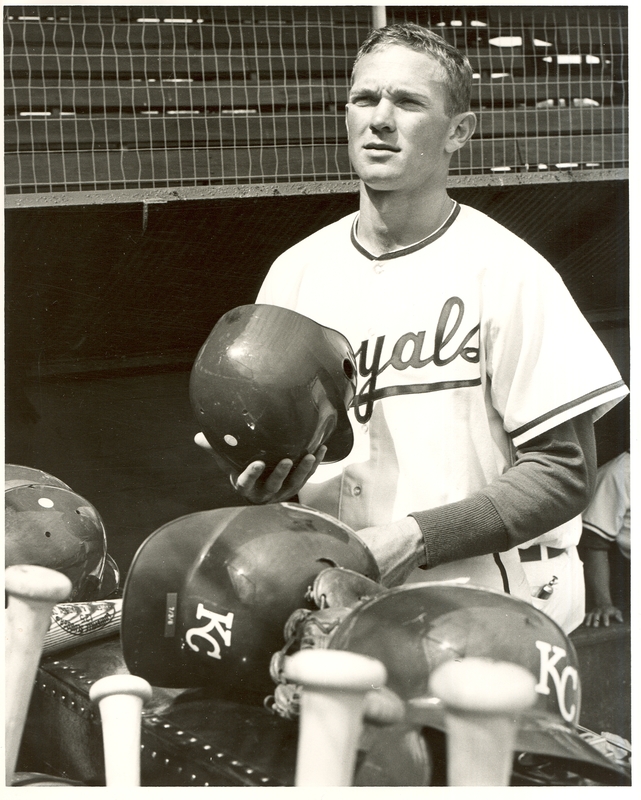 But it was pinch hitter Joe Keough (pictured above) who drove in Joe Foy with a 12th inning RBI single giving the Royals a 4-3 victory. The game was also the major league mangerial debut of the unforgetable Billy Martin. In eight years in the Twins organization after his playing career had ended Martin had been a scout, major league coach and minor league manager. But his stormy big league mangerial career started on the same day of the Royals very first game. Martin’s stay in Minnesota ended after one season – despite winning the division title. In a sign of things to come, Billy was fired after the season largely as a result of a fight he had with pitcher Dave Boswell that August. Martin was a fighter from beginning to end. Here’s another interesting tidbit from that game – umpiring that day at third base in his very first major league game? Don Denkinger of course. History just has a funny way about it. Denkinger?s last game (according to Retrosheet) was also in KC. It be interesting to hear Denkinger?s thoughts on that 1st game in?69. He?s from Iowa, so it must have been neat to work you first game in the city relatively close to your hometown. Don also worked the 1980 World Series, getting an earful from Jim Frey after Dickie Noles dusted Brett in game four.